AVAILABLE IN 5 OZ AND 13 OZ BAGS. Serve as a complete meal, or pure joy on top of kibble. A complementary blend of fruits and vegetables helps provide the necessary vitamins & minerals to make a complete & balanced meal. All ingredients are carefully handled to minimize processing, formed into bite size pieces, and then quickly frozen to support nutrient retention and flavor. 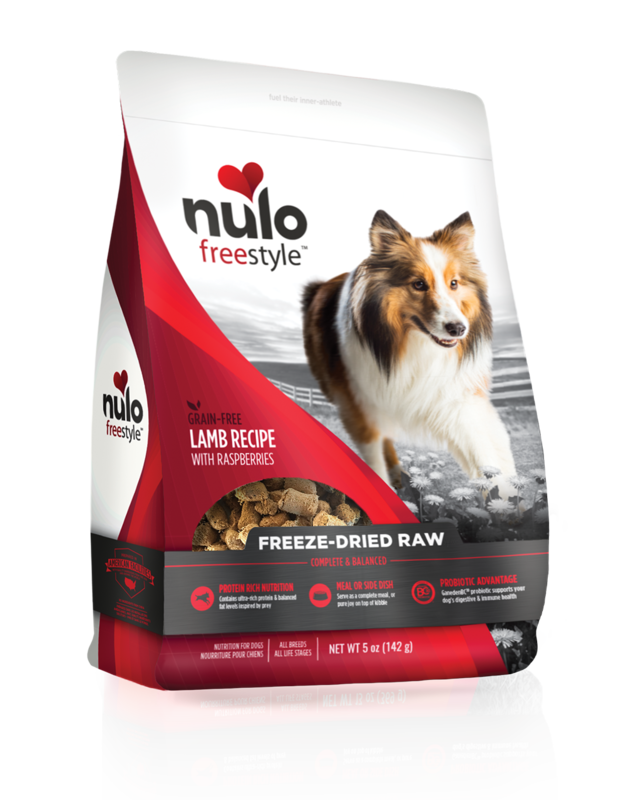 Nulo's freeze-dried raw recipes are made using a multi-step food safety process. We partner with suppliers who continually provide high quality ingredients according to our exact sourcing standards. Lamb, Lamb Liver, Ground Lamb Bone, Lamb Kidney, Raspberries, Broccoli, Apples, Dried Egg Yolks, Butternut Squash, Green Beans, Blueberries, Carrots, Kale, Spinach, Parsley, Apple Cider Vinegar, Ground Flaxseed, Salt, Dried Kelp, Inulin, Dried Bacillus coagulans Fermentation Product, Potassium Chloride, Salmon Oil, Zinc Proteinate, Iron Proteinate, Mixed Tocopherols (natural preservative), Vitamin E Supplement, Copper Proteinate, Manganese Proteinate, Vitamin D3 Supplement. FreeStyle Freeze-Dried Raw Lamb Recipe with Raspberries is formulated to meet the nutritional levels established by the AAFCO Dog Food Nutrient Profiles for all life stages including growth of large size dogs (70 lb. or more as an adult). 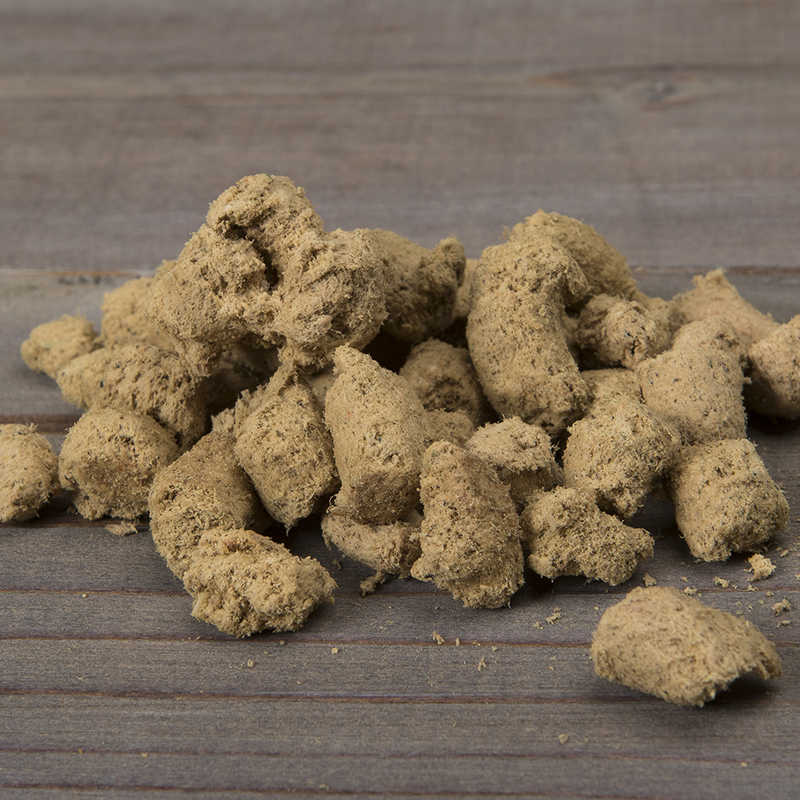 Serve out of the bag or crumble over your dog’s favorite kibble. For a softer, tastier texture add a little warm water before serving. To portion a complete and balanced meal for your dog, please reference the feeding chart below. Every dog is a little different, so the ideal feeding amount may vary with age, size and activity level. Use the information to the left as a starting guideline only and adjust as required. Always provide plenty of clean, fresh water and hugs. HOW TO TRANSITION Gradually switch your dog’s current food with the new food, replacing a little more each day over the course of a week. SAFE HANDLING GUIDELINES This product is not for human consumption. Prepared from inspected and passed meat and/or poultry. Some food products may contain bacteria that could cause illness to you or your pet if the product is mishandled. Keep raw products separate from other foods. Wash work surfaces, utensils, hands and any other items that touch or contact raw products with hot soapy water. This product contains raw ground bone.